Love is better shown than said as this decorative wall art states when it graces your foyer or entryway. The Couples Love Rules decal is available in custom sizes and in single-color or 2-color combinations. Rules protect us and point us in the right direction. Couples to have rules that make sure that their relationship stays strong and on track. At DecorativeLettering we have come up with a novel way of reminding and helping couples stay true to each other. We have wall words that are suitable for them. They will look amazing up on the walls of their bedroom. As shown in the photo, they can take up quite a bit of wall space, but they look great. They contrast well with the underlying wall and tie in well with the decor in the room: molding along the door and the bed frame. 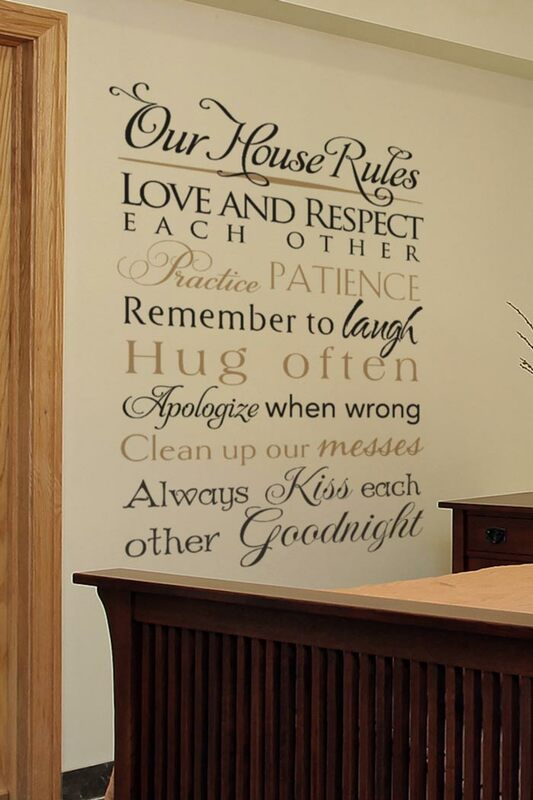 Couples will love the gentle and subtle help on the wall that’s rooting for their marriage. 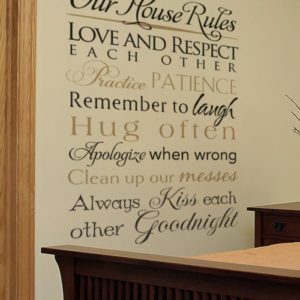 Are you looking for wall decor that is suitable for couples and will look great in your bedroom. Try DecorativeLettering products. We have wall quotes that are custom, from scripture to famous sayings by well known personalities: there is something for everyone! Our wall decals are durable. They are easy to take care of: very low on maintenance. You can also remove and reapply onto another spot without any problem. We have an excellent team of designers who do their best to make sure you get your money’s worth on wall decals. Are you looking for a wedding or anniversary gift? Do call or email: we have what you’re looking for …and its affordable!